DETROIT, Michigan, December 21, 2009 (ENS) – The State of Michigan filed a petition to the U.S. Supreme Court today to close canals near Chicago to prevent invasive Asian carp from gaining access to the Great Lakes through Lake Michigan. Michigan Attorney General Mike Cox asked the U.S. Supreme Court to order federal, state, and local officials responsible for Chicago-area locks and waterways to close them immediately to stop the Asian carp. The fish are an aggressive invasive species that could quickly devastate Great Lakes fish populations, causing severe damage to Michigan’s economy by ruining the Great Lakes’ $7 billion fishing and tourism industries. He requested operation of the sluice gates at the Wilmette Pumping Station, the O’Brien Lock and Dam, and the Chicago Controlling Works in a manner that will prevent carp from passing into Lake Michigan. Cox is seeking a court order for the creation of new barriers to prevent carp from escaping from the Des Plaines River into the Chicago Sanitary and Shipping Canal during flood events, and from getting to Lake Michigan through the Grand and Little Calumet Rivers. Comprehensive study of the Chicago waterway system to define where and how many carp are in these waters, and to eradicate them is necessary, Cox says. Finally, he seeks action to permanently separate these waterways from the Great Lakes. All four species of invasive Asian carp in U.S. waters – silver and bighead carp, as well as grass and black carp – are an urgent threat to the Great Lakes ecosystem, said the Natural Resources Defense Council in comments provided Friday to Susanne Davis of the U.S. Army Corps of Engineers. The comments address a proposal by the Army Corps to construct a series of semi-permanent concrete barriers and chain-link fencing between the Des Plaines River, where the presence of Asian carp was detected in September, and the Chicago Sanitary and Ship Canal to prevent flooding in the Des Plaines River from allowing Asian carp to bypass the dispersal barrier to the north. “More action is needed, and more quickly, if we are to ensure that the catastrophe we all agree is possible – but not yet inevitable – is averted,” the NRDC warns. Michigan’s petition to the U.S. Supreme Court comes after Illinois and federal authorities reportedly executed the largest fish kill in Illinois history earlier this month in response to the discovery of Asian carp DNA just a few miles from Lake Michigan. That action uncovered a carp near the electrical fish fence built specifically to deter the invasive carp, causing Cox to call for immediate action to once and for all address the potential devastation of the Great Lakes, before it is too late. Common carp, brought to the United States from Europe in 1831, were soon propagated and distributed throughout waters of the Upper Mississippi River System, according to the U.S. Geological Survey. Grass carp were imported from eastern Asia in 1963 to control algae in catfish farms and were first documented in the Mississippi River along Illinois in 1971. Silver carp and bighead carp were imported from China in 1973 to improve water quality of aquaculture ponds, initially in Arkansas. These species have invaded Midwestern rivers, through pond escapement or by deliberate introductions and were first documented in the Upper Mississippi River System as early as 1982. Reproducing populations of all four species are now present in the Upper Mississippi River System. There are proposals to start business ventures harvesting the carp that have infested the Mississippi River system over the last few years, to use for food, fertilizer, and biofuel, turning a pestilence into an opportunity. Carp are good to eat and they are considered a delicacy in many countries. 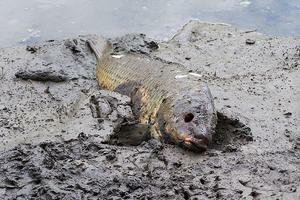 One of the problems with carp, however, are two rows of small floating bones above and below the lateral line. Another problem is that due to their long life span, feeding habits, and fat content, carp are more likely to take up and accumulate environmental contaminants than other species.